Your endodontist uses root canal treatment to find the cause and then treat problems of the tooth's soft core (the dental pulp). 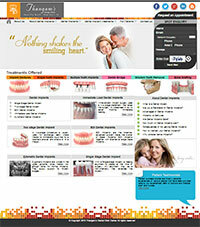 Years ago, teeth with diseased or injured pulps were removed. Today, root canal treatment has given dentists a safe way of saving teeth. Root canal treatment is mainly performed for two main reasons. The first is infection. An untreated cavity is a common cause of pulp infection. This untreated decay usually erodes the enamel and dentin of the tooth and leads to a root canal. This allows bacteria to infect the pulp. Antibiotics can't get to infections inside teeth. The inflammation caused by the infection reduces the blood supply to the tooth. The reduced blood supply also keeps the pulp from healing. 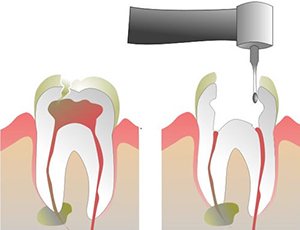 The second reason for a root canal is damage to the pulp that can't be fixed. Trauma or a fractured tooth can damage the pulp. So can a lot of restoration, such as several fillings placed in the same tooth over a period of time. Sometimes, common dental procedures, such as preparing a tooth for a crown, can hurt the pulp. Then the tooth might need a root canal. If root canal treatment is not done, an infected tooth may have to be extracted. It is better to keep your natural teeth if you can. If a tooth is missing, neighbouring teeth can drift out of line. They also can be overstressed from chewing. Keeping your natural teeth also helps you to avoid other treatments, such as implants or bridges. Also, if you ignore an infected or injured tooth the infection can spread to other parts of your body. Having root canal treatment on a tooth does not mean that the tooth will need to be pulled out in a few years. Once a tooth is treated, it almost always will last the rest of your life. The procedure is usually performed using local anaesthetic. If the pulp is infected, anaesthesia may not always be necessary because the tooth no longer has any feeling. The affected tooth is wrapped in thin rubber (called a 'rubber dam') to prevent contamination of the root canals. The decayed portions of the tooth and any affected filling are removed. The pulp or pulp remnants are extracted. The dentist uses a special drill and small instruments to thoroughly clean and shape the root canals and to remove bacteria, pus and debris. The root canals may need to be shaped or hollowed out to ensure a smooth interior surface. The interior of the tooth is flushed with disinfectants and then dried. If the root canal is not infection free, it may be medicated and the tooth sealed with a temporary filling material. You may have to wait a few weeks, or even months, before the pulp canal is filled. If the dentist feels bacteria are still present at your next appointment, the cleaning procedure may be repeated and the tooth once again packed with medication. This stage will continue until the dentist feels the tooth is free from bacteria. The infection-free root canal is then sealed with long-lasting barrier materials (the root filling), usually a rubber-based material called 'gutta-percha'. The tooth then undergoes restoration and the biting surfaces need protection - an artificial biting surface for the tooth is fashioned out of regular filling material. In many cases, where there is considerable loss of the tooth structure, there may be a need for an artificial crown made from porcelain or gold alloy or other materials. The duration of the treatment depends on the amount of infection present. The treatment can be completed in a single appointment or may require more than three appointments. Your restored tooth could last a lifetime, if you continue to care for your teeth and gums. However, regular checkups are necessary. As long as the root(s) of a treated tooth are nourished by the tissues around it, your tooth will remain healthy.